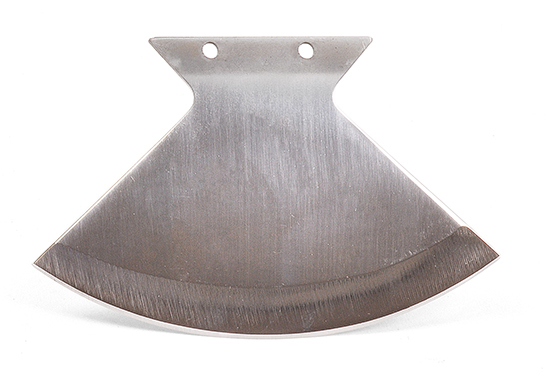 Invented by the native Alaskan people over 5000 years ago, the Alaskan ULU, was used primarily to clean and skin fish. Today, people find them very useful in the kitchen for cutting and dicing and also out in the field. Originally the handles were made of bone, ivory or wood inscribed with distinctive designs, but today many materials are available to use on the handles. Use your imagination, and make several. Made of 440C stainless steel, polished to a MIRROR finish. Blade is 5/64" thick (just under 2mm), with 5-7/16" cutting edges and holes for 3/16" pins. This blade has been CRYOGENICALLY TREATED to increase its edge holding properties.